Switch Lotion is a ready to use liquid solution to facilitate the maintenance of Sweet Itch in horses, ponies and donkeys. Easy to use thanks to a calibrated dispensing chamber found within the applicator bottle. 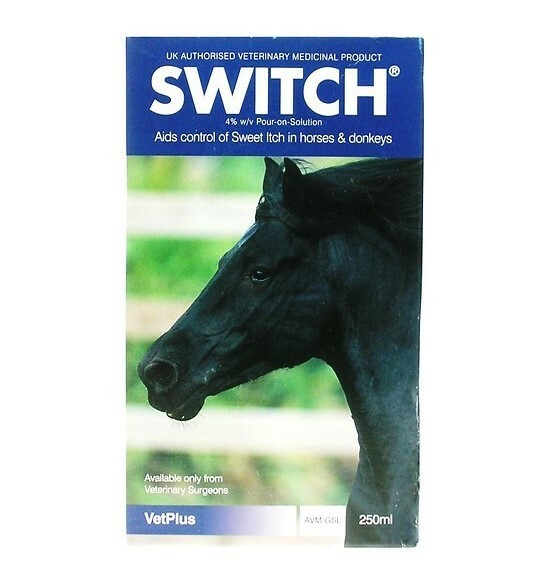 Use Switch Lotion at the start of Sweet Itch season and repeated as and when needed. 4% w/v (4 g/100ml) Permethrin (cis:trans 80:20). External pour-on liquid to aid control of Sweet Itch in horses & donkeys. Switch is a ready to use solution that should be applied at a rate of 1 ml per 10 kg bodyweight to a maximum of 40 ml. Apply Switch using the calibrated dispesing chamber incorporated into the applicator bottle. Apply the measured dose in roughly equal portions to the mane and rump avoiding the saddle area. Treatment should be started at the beginning of the sweet itch season and repeated as necessary. If horses and donkeys are to be groomed, apply Switch after grooming. Below are some recent questions we've received regarding VetPlus Switch Lotion for Horses, including answers from our team. It says in the description to reapply when necessary, on average how often would this be? I don’t really want for him to start itching again before re application? If need be this can be repeated weekly. Can it be used on a mare that have a baby nursing? This is safe to use providing you do not cover the area that the baby feeds from. Can switch be used on pregnant mares? Can switch be used on pregnant mares to kill lice? Yes this is acceptable. As long as you use it in accordance with the manufacturer's directions, it should be safe for a pregnant mare. A new horse in the yard has a huge burden of lice. We are using liquid Switch, can you advise length of treatment and quarantine required please? If one has a huge burden, any of the others may have a few and are acting as carriers. Complete elimination is best achieved by treating all in-contact horses as well. Treatment/quarantine continues for 2 weeks after no living lice can be found anywhere on any horse. It is possible just to treat the horse(s) which appear to have lice and eliminate them, but this is less reliable because some transfer of lice tends to occur without you being aware of it. I would have to wonder if the badly affected horse is in poor condition or has Cushing's disease or something. As a general observation, well groomed horses in good physical condition rarely suffer with lice, though they might have the odd one or two in the dense hair of the main etc. Immuno-compromised horses are more likely to suffer. Therefore as well as treating the lice, it is worth considering if the general health and grooming could be improved. There is plenty of good advice about this topic online and of course you can ask your vet too. Pony had rubbed it mane and has a couple of damaged areas of skin on the mane. Can switch still be applied. Switch can be used on broken skin and indeed it is usually applied to areas which are rubbed and prone to getting sore. It should not be applied to extensive wounds, but the sort of abrasions likely to be encountered are not a significant problem. Indeed in a way you have to try and do something to reduce the itching, or the wounds will get worse. Can the horse be used for riding whilst using switch? A horse can be worked as normal when Switch is used, this is completely fine. I'm wondering if this product can be used on horses intended for human consumption or not. 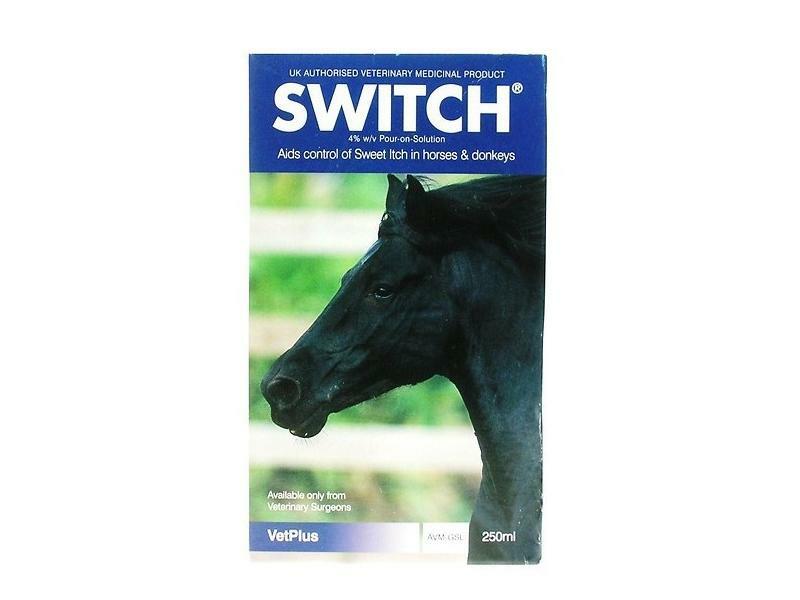 Switch should not be used on horses that are for human consumption. You could measure what is known as the heart girth, which is around the midsection, immediately behind the elbow and withers. Then measure from the point of the shoulder to the point of the buttock (tuber ischii). There are calculators online where you can enter these details and it will give you an approximate weight.